The countdown to moving day is on! T minus 2 days until closing and 3 days until we move! We spent the weekend packing, packing and packing. We’re pretty much down to bare bones now, though it feels like there is a lot left. Every night when I lay in bed, I think of all that we have to do. Clean the new house before we move in. 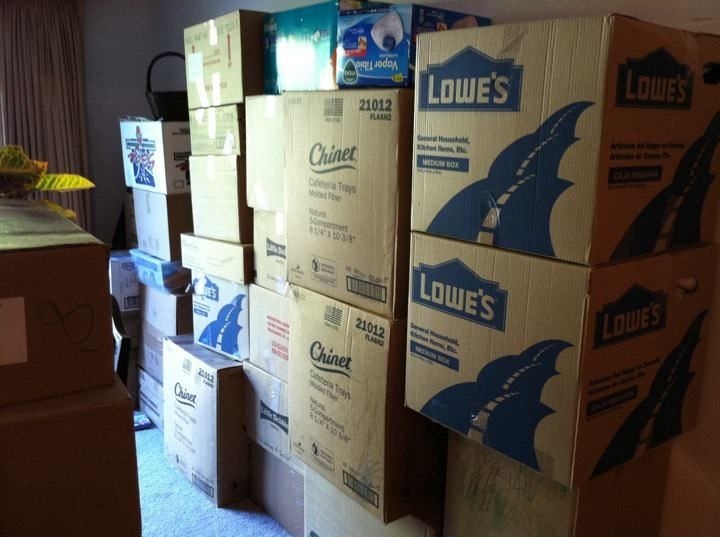 Pack the remaining items to get ready for the movers. Move everything. Clean our old house. Plus other stuff like buying new furniture (I know this can wait a bit but I don’t want to put it off too long), unpacking, organizing and settling in. I worry about everything that could go wrong, all the money, the closing, getting Munchkin adjusted, getting Samson adjusted, etc. Not to mention Isabella’s birthday is in there. My mom has offered to host the family get together at their house and she’s making Isabella’s favorite – fettuccine alfredo. I ordered the cake today. Munchkin specifically asked for a Curious George cake. When I called the store they said they didn’t have a kit for that. I pretty much told the guy I would have to go elsewhere because that was all she asked for and dammit, she was going to get it! He said he’d call around. He found someplace that had a C.G. edible overlay and said he’d go out and buy it for us. Winning!! Now that’s what I call customer service! 2 more days of work and then the madness can begin! My favorite hodliay tradition has always been getting together with my 3 sisters and their children to do our Christmas baking! We have a blast, not only making goodies, but also singing Christmas Carols and enjoying each others company, then we take our goodies to several Nursing Homes and share songs and goodies with the residents! It teaches our children the spirit of giving! !